As Americans grow increasingly weary of involvement in messy overseas conflicts and espionage-flavoured intrigues, foreign dignitaries’ travel to US has in this transition time between two administrations grown increasingly more complicated —and potentially perilous to their political aggregate — as they try to show their foreign policy bona fides to America. For the foreign policy bona fides on show to America or any foreign country, to be seen as genuine it must, usually, be first seen as having been cemented in practice and demonstrated in one’s own country. Otherwise, all kinds of politically unsavoury fallout can and will drop like a hot potato there where it hurts. In the spirit of the mainstream media’s view that the public has a right to know details of the purpose of the President’s overseas visits, regardless of how biased this mainstream media leans away from the conservative side of the political spectrum from whence the President came, it does strike one rather disquieting and odd that more details as to the purpose of the President’s visit to Washington weren’t forthcoming for days. It can justifiably be assumed that this secrecy regarding the purpose of the visit was responsible for the restless spate of terrible, vicious, insulting media attacks and ridicule against the President within Croatia during the past week. For optimal success, there’s that crucial and vital thing called risk assessment and risk management we must attend to carefully in what we undertake in various aspects of daily life, in work or politics. It would appear none of that was a part of the considerations flagged at the President’s Office regarding the information the public will have about the Washington visit. Yet another blaring example of hopeless gaping holes in the President’s political and media analytical team. However, if by some chance there were such a prudent thing, as assessing the risk of not saying anything, then most likely the President would not have copped so many vicious, insulting attacks. The risk would have been managed and or mitigated. But then, denying the public even the basic information about the visit to Washington could actually have been a carefully planned trigger for a public outcry that would paint Croatia politically unstable in the first place (?). Impose, assert, be proactive…I could not agree more. Generally, an important distinction is made between assertiveness and aggressiveness. To be assertive is to be forthright and firm, but to be aggressive is to be rude and pushy and that often earns enemies more than it does successes. It’s the former the President meant, so thumbs up on that. Asserting ones stand is the stuff of what most would see as good politics. It’s a shame though that this assertion in foreign politics President Grabar-Kitarovic speaks of has not been noticed when it comes to Croatia’s foreign politics on neighbouring Serbia and its constant abuses and lies against Croatia. If assertion of Croatian rights and interests had been established as the way of carrying out foreign politics, then Serbia’s Prime Minster Aleksanadar Vucic’s representative, or anyone from Serbia, would not dare stand on Croatia’s soil and threaten Croatia or maliciously imply wrongdoing against Serb minority living in Croatia! A shattering, terrible, intolerable thing happened in this line of foreign politics smack in the middle of Croatia’s capital Zagreb on Thursday 5th January while the President was still out of the country in Washington. And, the President has not yet reacted to it with even a whiff of that assertion in foreign politics she mentioned in front of TV cameras in Washington. Disappointing to the core! Shock, horror – all that the Croatian leadership could muster by way of reaction was a rather mild criticism and statement of inappropriateness of Bozovic’s message to Croatian citizens of Serb ethnic background, as well as reminding people that Croatia was a victim of Greater Serbia aggression (in the 1990’s)/and not the other way around. No walking out of the room by the Croatian leadership in disgust and protest, or better still – no showing the guest from Serbia where the exit door was. Neither the President, or the Prime Minister or the Foreign Minister of Croatia have shown any assertiveness in protecting the Croatian people and nation and state from the persisting abuse that has been coming out of Serbia. It does infuriate and inflict true pain when Serbia’s representatives, acting in promoting Serbia’s quest of denial of their own war crimes, display an ease at going about abusing Croatia and her people on her own soil. From Facebook: Another great article about the imbalances in homeland politics. Where representatives don’t always create policy. In many ways, Croatia is having an identity crisis. But the gradual change of the minds and opinions throughout Europe is threatening the political class with their militant agenda for political correctness. This is a fascism of Tolerance which only leads to cultural Marxism, the worst form of social cancer on society. I’m glad people are waking up to this issue of soft censorship through public labels. In the end, that is all the social engineers have to use to silence the people who like to share opinions without fear of manufactured public shame. Identity crisis for sure and yet it does not need to be so, Branko ML, some might say but it will be until the communist elements are cleaned out and cleared, hopefully some blanket strategy will come. Thank you for your feedback. Your articles focus on an element which is neglected from socio-political discussion these days…Croatianism! I’m sick of people becoming ‘self-hating’! It is part of this ‘virtue-signaling’ generation…but it seems to be counterintuitive. If one can’t love themselves as they are, how can they have the equal capacity to love others? Well said Branko ML, opinions are unpopular only with those who feel affected by sharp shooting and are too vain to see themselves and around them, From the start I intended to focus on the neglected or needed for transitioning from communism the most, there are plenty of those around who keep nodding to everything ..
Well hello, John – happy New Year to you too. Betrayal is the word that describe croatian MPs which allowed that to happen. No No No WE DO NOT WANT ANOTHER jugoslavija! No No No cyrillic letters again! Serbia in UE = Russia in UE! From facebook: I’m pretty sure the trip was announced, but details such as faux fur vs. tweed, pumps vs. flat soles were left out. This of course just can’t do for the inquiring minds of the ever-so-diligent Croatian media. I mean, if it wasn’t for them, I’m sure Kolinda would have been playing baccarat in Atlantic City or swimming with the dolphins somewhere in Florida. Kidding aside, being in a representative democracy, we elected her to do certain things on our behalf. We should be glad she has been doing a pretty good job so far. Also, as she gets further on into her mandate, I’m 99% certain that there is at least one mole in her office that’s responsible for protocol and avoiding fiascos like this given the nature of our lecherous media. Not only that but lapses in security, recall porcine Domagoj Margetic getting right into her face during a disrupted panel discussion on freedom of speech recently. Something stinks. I have no words for this….. What next? Let the Serbs role theirs tanks in again? What a joke! Sadly the nationality known as Croatian and the country is slowly becoming a puppet state ( heard that term before I recall ) a minority on it’s own soil. The saddest part in all of this, the thousands of lives that were lost for a dream.The homeland war – only 25 years ago,my how time flies .. Lest We Forget the homeland heroes and their families. Since KGK is the subject of your post and it is coming up to the second anniversary of her term as President, I cannot help but look back at her inauguration ceremony. The pageantry that such an occasion invokes, while expected, still has the effect of leaving one with a lump in the throat and a swelling of the heart. The patriotic atmosphere emanating from the thousands of spectators there, the singing of the anthem….the unabashed patriotic symbolism, the solemnity of the oath of office….one felt hopeful that Croatia was changing its course towards a better future. In her inaugural address to the nation she averred…..”…Special thanks to Croatian Defense Forces who were and will remain the cornerstone of our Croatian Homeland….I will uncompromisingly advocate for those most endangered/marginalized in or society….I am cognizant of my responsibilities towards those Croatians who chose me through direct elections….You entrusted me with your confidence, I will be beholden to you…. I will be your voice, I will be your President….if and when I make mistakes, I will have the strength to correct them.,.I will never do anything against the Croatian national interests!…..Unfortunately, these have been proven to be hollow words. her and our other high officials I see no such intention nor inclination. They are the quislings, they are the puppets. Time for a change in the right direction! What a s*it show in Croatia. It’s painful what these idiots are allowing to happen to Croatia. We look like fools because we are led by clowns. I haven’t seen anything about the President of Croatia visiting DC in “The Washington Post” in print. (It could’ve been in another paper–I know there’s one newspaper specifically covering the foreign diplomatic community in DC for general readership) I first found this out from reading the English language news site BalkanInsight.com this past week. Some foreign leaders and heads of state get more attention than others when they come to Washington, DC. If it’s a state dinner at the White House, it’s a big deal. Speaking of President-elect Trump, his new DC hotel has seen a number of foreign visitors, both diplomats and private citizens, checking in to stay when they come to town. 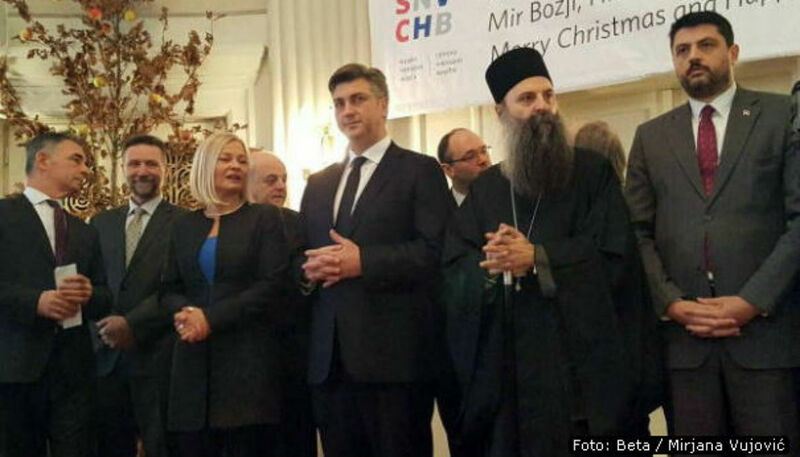 Andrej Plenkovic was not required to attend nor TV coverage given, a minority religion is a private matter, Croatian society only has to allow a minority to practice it’s religion. All the Croatian MPs should have left once Bozovic said what he said or responded to Bozovic directly with cameras rolling “Croatia protects its own citizens, Serbia has shown its lack of capacity in this regard”, Done! Now the EU is exerting pressure on Plenkovic not stand up for Croatian minority rights in Serbia. The Croatian MPs really are a comedy act. Surely you would have spoken to “Angela Merkel” before making objections for Serbia’s EU membership, so whatever was objected to would be backed by the EU and addressed, 101 in foreign diplomacy and management. At least extract some infrastructure funds from the EU if you want Croatia to be silent. Germany knows who and what is in power in Croatia. Dr (???) Plenkovic there is a line between incompetence and mistakes, you and your ministers have now crossed it numerous times. Just like your predecessors. Too many Doctors in Croatia although none are able to prescribe aspirin. National Geographic has a series on how Vladimir Putin came to power, the parallels between Russia and Croatia are amazingly similar. “Bradstvo Jedinstvo’ but only for a select few! Communists are willing to go to war and kill their own people before handing over power or giving back the stolen money. This is not the Croatia our fighters gave their lives for, nor the intention of the hard working Croatia Diaspora who supported it’s independence. Croatian’s in Croatia need to support Project Velebit for Croatia’s future. Sretna Nova Godina, bi ce bolje valjda! New Year will be better, Splithead 🙂 and yes either the Croatian leadership should have walked out or they should have shown Bozovic the door. This is not the first time an official of Serbia’s government has been doing this throwing abuse and threats against Croatia on Croatian soil and every time it goes by without any diplomatic consequence. And so if Croatia doesn’t set it standards on that Serbia will set them for Croatia or somebody else will by doing what Bozovic has done and the world will think it’s OK. Terrible, unacceptable stuff. LIBERTY FOR PEOPLE TAKES HARD WORK AND IS NOT ALWAYS WANTED BY THOSE IN–OR FORMERLY IN–POWER. Ina, 2017 will be no better unfortunately, the ruling party have shown their colours. Quote of the week from the honorary Ruza Tomasic. Functional,short, sharp and too the point. Nek joj bog da josh unucad, pravo Celjade, Zena, Majka i Baka. Makes the rest of the politicians look like armatures, again! I feel a lot of hatred and frustrations here. One should focus on creative, bright future not on hatred. No hatred here dejan, only the one expressed by Serbia’s rep at the reception. One must react to injustice and things that must be fixed. If Croatia does not set her standards of what it will tolerate of foreign dignitaries on her own soil, like most civilised nations do, the Croatia’s standards will be set by foreigners who walk all over Croatia and people with abuse and vicious lies on Croatian soil. This is not the first time a Serbian government rep has said such awful things in Croatia. Hatred is not wanting better things hatred is not saying anything and allow ugly things to go on. This article is an analysis and comment and all facts in it are facts so its based on facts. When I was still 16, the Croatian president I remembered was Franjo Tudjman and Slovenian president was Milan Kucan. Btw, can Slovenian and Croatian understand each other while speaking in their own languages? And do Croatians understand Polish too? It is very interesting to read the opinions that has caused your article. It has been a forum for debate, and I, who am on the other side of the continent, feel more curious to understand this policy very different from that of South America. I got totally hooked on the subject. Greetings. Guys, pls. accept that you are now living on Europe’s soil. It is bitter to hear that you are constantly nourishing the old hatred. Right wing ideology has no place in our European future. Thanks to dejan e.a. who seem to have another attitude. And to say it with Sartre: L’enfer, c’est les autres. Stefan,indeed it is hard for you to understand us (croatians) since you do not have relatives who fought and died for your country….My cousins died for CROATIA and for me all people who fought our liberty are HEROES! Ante Gotovina is a HERO along with all croatians who fought Domovinski Rat. For your information the agressor was Serbia.We defended our country. If you are a kommunist or a socialist please go to Beograd or Moscow they will be very happy to enlist you in the left wing army… trust me your brain was heavily washed… Kindly asking you to post your idiotic ideas in a Serbian or Russian newspaper…Croatia fought against kommunism and we will aleways do. So please post your leftist venom elswhere… I know I am a fascist! an american imperialist, bla bla bla bla! Shame on you you really missed history classes…. Actually, she could simply be processing, or waiting for Trump’s inauguration before speaking, or waiting for him to respond back to her… patience.